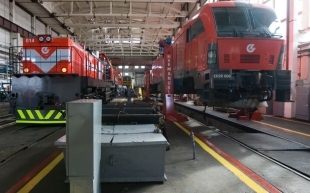 Vilniaus Lokomotyvu Remonto Depas (Vilnius Locomotive Repairs Depot), a subsidiary of the state-run Lietuvos Gelezinkeliai (Lithuanian Railways, LG), will repair locomotives of the Polish logistics company CTL Logistics, reports LETA/BNS. "Representatives of the Polish company conducted a thorough audit of our services. After acknowledging that we meet the highest standards, they confirmed that their first locomotive will arrive in our depot at the end of this month. This contract for the first time in history opens the gateway to the market of the so-called European gauge of 1,435 mm, providing an opportunity to consolidate our competitive position in the region," Albertas Bajorinas, CEO of Vilniaus Lokomotyvu Remonto Depas, said in a press release. The depot will repair a total of seven TEM 2-type locomotives of the Polish company. The value of the contract with withheld. CTL Logistics provides railway and transport logistics services on Western and Eastern European markets.